How to create your own product template. 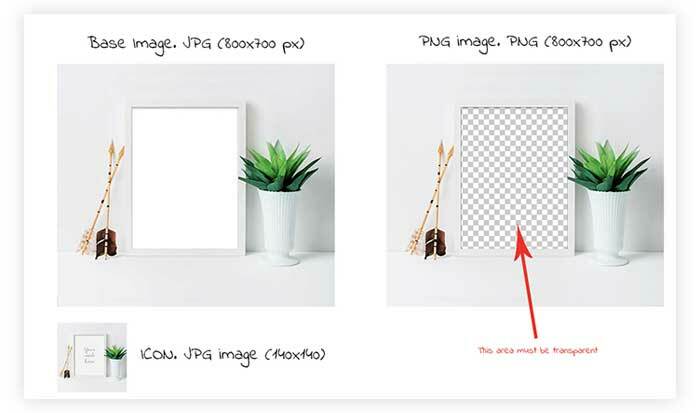 An 800x700 pixels JPG file with the base image of the product. An 800x700 pixels PNG file with the mask of the product where the customizable area of the product must be transparent. In the sample, you can see the icon image, the base image and the mask image. Notice that the mask image is transparent just in the customizable area of the product. The base image will stay below the customer design and the mask will be put over the customer design. For this reason, the mask must be transparent; for not to cover the design made by the customer.